Hi everyone, hope your weekend has been a good one. We got some cattle work done today so that left me feeling quite productive! I had a play with a new metal stencil and distress inks to create this panel. I sponged bundled sage in the background and dabbed peeled paint with a finger dauber. I'm linking up to the challenge at Addicted to CAS where the code word is Far Away. I'm sending this to a friend who's recovering from surgery. He lives about 7 hours drive away and I can't get down to see him. I think the fern leaves look as if they're reaching out into the distance so look far away too. At Virginia's View Challenge the theme is stencilling. Virginia has lots of links and amazing examples for inspiration. The Card Concept has a butterfly theme with this gorgeous pic for inspiration. I think this card fits the clean and simple category. Materials used: Dreamweaver fern stencil; distress inks; Hero Arts Antique Engravings butterfly stamp; Inktense pencils; Memory Box butterfly delight die; blue vellum; sentiment sticker and bling. Cathy, this is really a nice card for a guy. I'm sure he will like it and hope he recovers quick. I just saw a fern stencil yesterday and didn't get it. After seeing your gorgeous card I may have to make a trip back to get it. That stenciled fern is just gorgeous - it gives it a different quality than stamping - LOVE! Just stunning and beautiful Cathy. I love the fern leaves and your choice of colours it makes for a gorgeous background, combines with blue butterflies - just perfect. I just love ferns and adore your sponged panel and those butterflies! Great card! How beautiful is that stenciled fern! The layering and design are awesome! Well done, Cathy! Thanks so much for joining the fun over Virginia's View Challenge! Love the trio of butterflies fluttering around the ferns! This is so pretty...love the stenciling and the very delicate butterfly...thank you so much for joining us this week at Card Concept challenge! Wow! This card just takes me away to some secluded natural setting. Gorgeous design,Cathy! I just cannot stop looking at your fabulous ferns. Thanks so much for sharing with us at The Card Concept this week! So LUSH and gorgeous!! LOVE the green, so REAL looking!!! Makes me want to kick off my shoes and walk in the tall grass!!! Thanks for sharing! 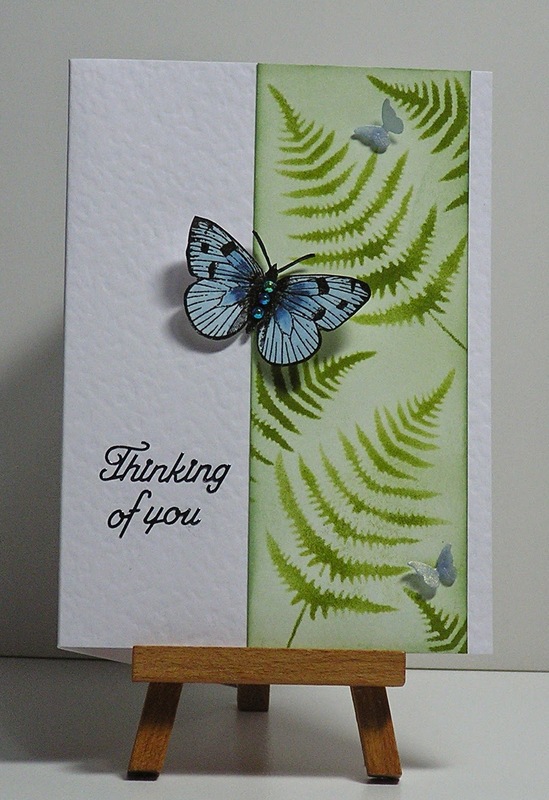 Your card is beautiful - love the soft look that you have achieved by inking the ferns! Very serene! A truly beautiful creation in every way!! Another beautiful butterfly card. The ferns are lovely and like the little butterflies which are giving the perspective to the main one. hugs Mrs A.
Gorgeous card. Great stencil. Love your design and the pretty butterflies. This is lovely! The fronds are so delicate! Love these sweet ferns! Such a pretty place for this beautiful butterfly to perch! How is it possible thathad not seen before this card? It is absolutely gorgeous. When I look at it, it seems to me that I am in a forest clearing, among the ferns flooded with sunshine. Wonderful feeling!